We have had the house now and finally have finished moving. Even the GF's mom down from Payson. Now the fun begins to find a home for all the crap we moved in. 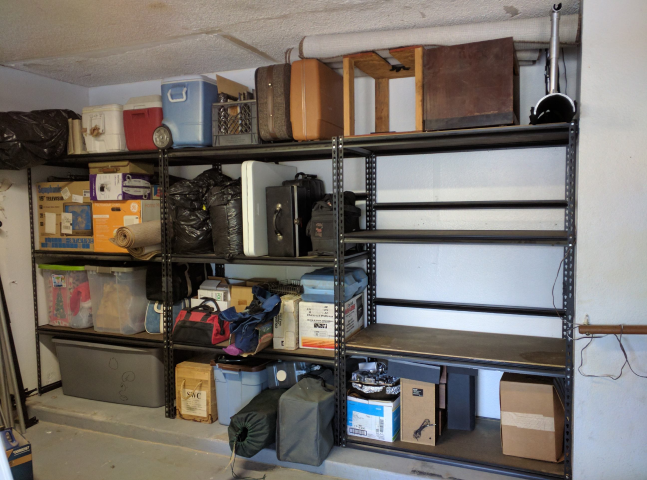 My first task was to make room to put shelving in the garage. So some demolition was in hand. Here is what we started with. Once we had everything out this is what we have. An area about 8' tallx3' deap and 12' wide. Once done and the 3 shalving unites I bought for $105. The are 2'deapx4'widex6'tall. This too a lot of the crap off the floor and out of the way for the next wave of destruction. 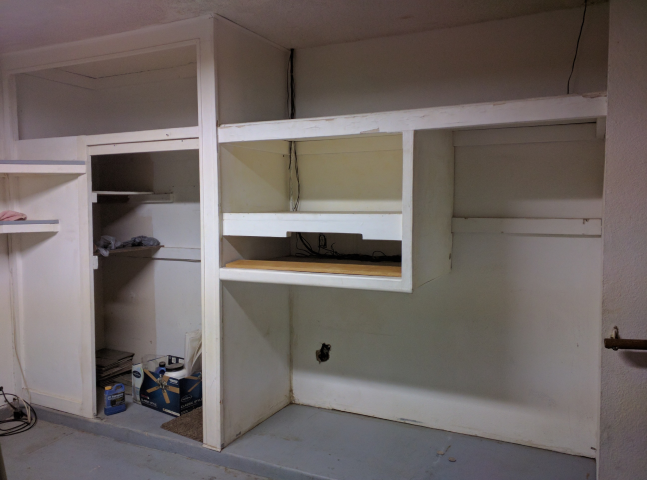 The open shelves on the right are for any boxes that need a home from inside. That all took Saturday and we finished up by noon Sunday. I spent Monday replacing the master bath faucet. I had to replace valves as well. One thing I hate the most is faucet replacement. They never go in with out trouble and a leak. During all these projects I have been replacing outlets and switches as they are wore out!!! Someone has run all sorts of power in the garage I hope It's not setup like what I found behind a micro wave that they had cut up a cupboard to get it out of the way. I will get them pics up as soon as I can. It's a wonder the hous didn't burn to the ground. OK Here is what was found in the Kitchen. I think I posted these before but want to put all this in one thread. The cord running down and out of the picture is from the micro wave, I just pulled it out and set it on the counter to see this mess. Good idea but bad execution of power supply and lack of space needed. Here is a closer look at the plugs. Note the green wire coming out of the grey cable. Thats the ground wire for the microwave that was split and a wire spliced in that went behind the outlet and was grounded to the metal J-box. This is just as it was once the micro wave was out. 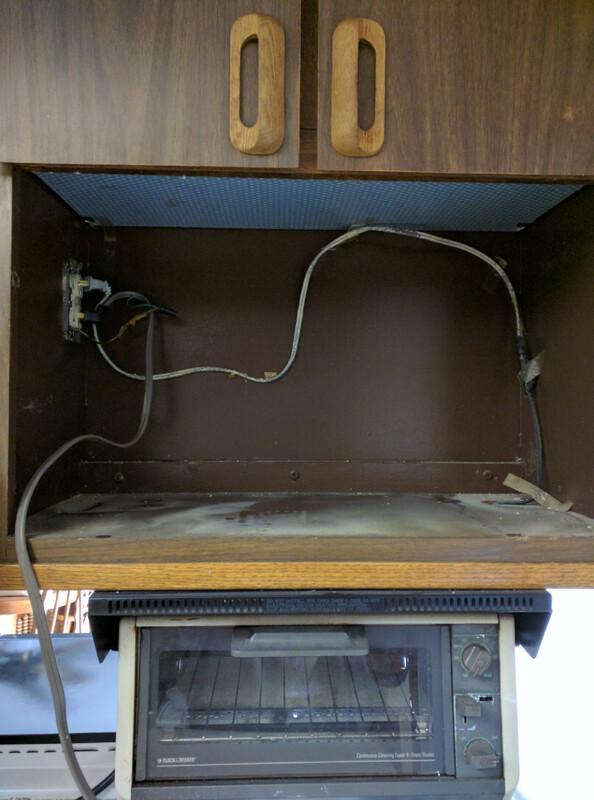 OH and as I was pulling the micro out, the toaster oven mounted to the bottom of the cabinet came on. They took the power coming down from the vent hood and swung it over to the outlet. Then took a peice of romex back over to where the original cord should have gone. Then took ANOTHER length of romex to a light on the other side of the hood. I took it all out and rerouted it all back to where it should. See the tack paper on top. Thats in every cabinet in the kitchen. They even wrapped the vent tube, inside the doors and lined the drawers with this stuff. 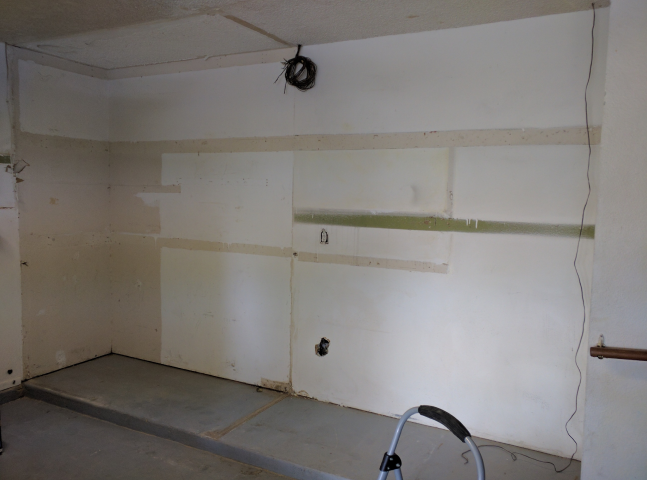 That will go when we are able to redo the kitchen. Forgot to mention. Back in the garage. See the hole in the wall mid way and low. There was a piece of romex that was tied into the outlet that faced inside that went down and under the drywall then out. Then was routed to the left and wire nutted off. That was removed. At the top in the middle and to the wire hanging at the right is a bunch of speaker wire. I will remove all that once it cools off and I can get into the attic. Inspection of power to the rest of the garage will be done at the same time. WOWWW!!!!!! Talk about an electrical disaster, almost need to rewire the place from the looks of it.. So far just removing the crap someone did should help a lot. Hopefully they used good wire in the garage and didn't use some small 14g wire for the whole garage. I can deal with 12g as long as it's not over loaded and split out to cover the whole garage on one circuit. I hope it's on at least two. Yeah, that could be bad news there, I had all 12 and 10 in mine and I had 4 circuits, AC/heat, the machines, the air compressor and lights, used 10 gauge on all the 220 stuff and 12 gauge on the rest, never had to worry about overloads, got the same thing here too. Thats the plan I have in mind to do. Not sure about doing 220 out there. I don't have anything that needs it. Even though I have been wanting to learn how to weld. Well, it's nothing to put it in while you're in there than have to add it later, it don't hurt for it to just sit there, but it'll be nice if it's there later when you decide you need it. Very true. I cross that bridge once I get to it. Next weekend not getting much done either with races Saturday. Hopefully I can dink with it here and there for the next couple weeks. Supposed to go to Tucson the 30th for the Fuel Alters running. Rumor has it Daddy Dave is supposed to be there. Sounds like more fun than wiring the garage. Fuel Altereds are always fun to watch, should be a good weekend. Thanks!!!! Nice to be able to rip things up and not worry about the owner getting pissed off. 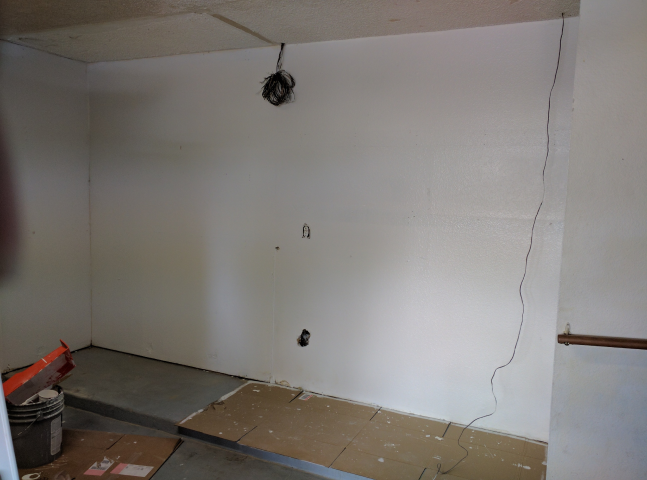 Been out the past couple evenings playing in the garage and getting a game plan for removing one wall and the work bench that is there. So far the breaker that's labeled "Work Bench" seems to shut the work bench power off. Still can't tell what was used for wire at this point. Will be checking outlets as I go to make sure there not hot as I get to them. Also was looking at the conduit that was used from the fuse box. It's only 1/2". I think I want to go at least 3/4 and rerout it. Where it goes into the attic is no where near the garage and used 90* fittings at each turn. No bender was used and it looks cheesy at best. Need to find a CHEAP trailer to toss the crap in to go to the dump. I hate to use one of the trucks. I would like to be able to toss stuff in as I go. Once the trailer is full then head for the dump. If I use one of the trucks, if I need to use it then I have all that stuff to haul around. Bummer you're kinda far away or you could just use mine, it's just sitting there doing nothing. Sounds like whoever did the electrical didn't know what they were doing, time to start over looks like.. I keep hearing this guy "Thought" he was a "Handy Man". I'm not a genius, but I will ask someone the best way to do something to do it correct if I don't know. If I'm not comfortable I will get help. I think this guy jumped into things not having to much of a clue and did no research. Absolutely, can't think of any other reason why anyone do such a sloppy job, and you know he didn't give any thought to the damage it could have caused. Folks have an Old military trailer that I'm going to go get that hasn't moved in at least 10 years. Will need tires but thats OK. It will give me something for now to toss crap into and haul off to the dump. Allergies have been kicking my a$$ so not much is getting done. I hope to get something done this weekend. Well, at least the weather is supposed to be nice, good time to get $h!t done. Was out last evening . Had one small board to pull off the wall and got the new shelving almost all put together. Hopefully I'll finish that tonight and get everything off the bench I'm tearing out. Will have pictures of this bench before I start my handy work. One good thing so far is the cooler is on it's own breaker. I have that shut down and have removed the thermostat it was hooked to. 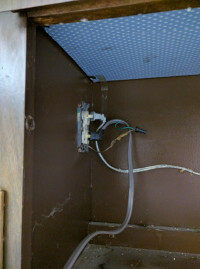 The way the wire was run it was in the way for where I was putting the new shelf's. Still not sure what I'm going to do with that.